Do they get water while at DayCamp? There is always generally water available to dogs, inside and out, although occasionally we must manage access if a pet decides it is fun to play in! We do our best to insure everyone drinks during the day, but they will often consume more water than your used to do the amount of activity they have had during their busy day. Should I bring food for the day? It’s not necessary to bring food for adult dogs, generally they won’t eat if it’s not part of their normal routine. Puppies and pets with health conditions requiring a meal during the day should bring food from home. 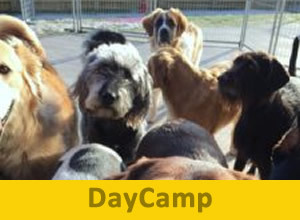 Puppies as young as eight weeks can attend DayCamp. Vaccinations must be up to date for their age and be given by a licensed veterinarian. We will call your clinic to confirm expiration dates. 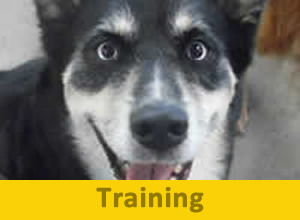 Rabies is generally not given until 12-16 weeks (varies by vet), but your puppy can attend until that time. 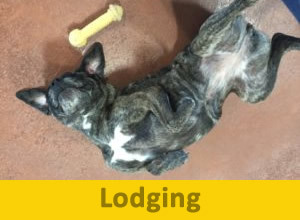 Mature, unaltered pets will not be introduced into playgroups, but can be accommodated in our Bunkhouse, for your convenience. Do you accept my breed of dog into play? We do not discriminate against any breeds! We believe all dogs, no matter the breed, should be evaluated individually. Not all dogs thrive in an open play environment; accommodations are available for all. Absolutely! You may come in any time during regular Lobby hours, no appointment is necessary. Please DO NOT bring your pet with for a tour unless they are already registered, and a reservation has been made. Reservations are needed for ALL Resort services. We staff according to reservations for the safety and well being of pets and staff. All pets must be up to date on Bordatella (kennel cough), Distemper combination and Rabies (for their age). Vaccinations must be given by a licensed veterinarian, whom we will contact for verification. Can my pet be groomed while in DayCamp? 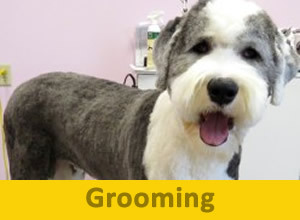 Grooming is available Monday- Saturday with an appointment. If you don’t have one scheduled at drop-off, we will do our best to accommodate. How early can I drop my pet off? Lobby hours are 6am-8pm Monday-Friday, 8am-6pm Saturday and 3-6pm Sunday (closed all major holidays. We offer 24-hour drop-off and pick-up, with reservations!